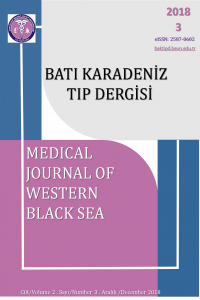 Medical Journal of Western Black Sea is a scientific publication of Zonguldak Bulent Ecevit University Faculty of Medicine. This is a refereed journal, which aims at achieving free knowledge to the national and international organizations and individuals related to medical sciences in published and electronic forms. This journal is published three annually in April, August and December. The publication language of the journal is Turkish and English. The aim of the journal is to announce quality researches in medicine and respective subjects to the national and international scientific environment, sharing and creating a continuous training platform to contribute to the provision of scientific and social communication in Turkey and abroad. In pursuit of these objectives in the journal original research, case reports, reviews, letters to the editor, biography, writings and conference proceedings brought to articles format are published. The papers presented at the symposium, congress, electronic media or preliminary studies can be published provided that this is stated. Editor and assistant editors review all submitted manuscripts initially. Then the manuscript is sent to the scientific advisory board member for evaluation. All the articles submitted to the journal for publication are referred to peer review. Corrections can be made in appropriate cases. Authors may answer some questions and may be asked to revise their article. Articles decided to be published in the journal would be taken in the process of page arrangement. At this stage, all the articles are checked for the accuracy of the information they give. Articles brought to the control of the authors are completed and submitted for approval prior to publication.